Gerry Adams was born in October 1948 and grew up in the Ballymurphy district of West Belfast. He joined Sinn Féin when it was still a banned organisation in the mid-1960s and along with other republican activists became involved in campaigns around bad housing and equal rights and attended the inaugural meeting of the civil rights movement in 1967. In 1972 he was interned without trial by the British and the same year he was released to participate in secret talks in London between Irish republicans and the British government. 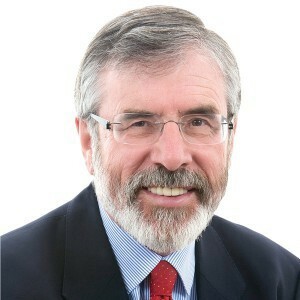 Gerry Adams played a leading role in the campaign for political status. He was a friend of Bobby Sands and knew many of the hunger strikers who died in 1981. In June 1983 Gerry Adams was elected MP for West Belfast and in November of that year he was elected as Uachtarán Shinn Féin. In March 1984 was shot and seriously wounded. Later his home was also bombed. In 1986 Gerry Adams was instrumental in launching the party's current peace strategy. He privately met with John Hume and in the following year Sinn Féin launched Scenario for Peace. In 1993 it emerged that the Sinn Féin President had been holding private meetings with the leader of the SDLP, John Hume. In the first of six joint statements issued by the two party leaders they set out their hope for the future. In August 1994 the IRA called a cessation of all military actions. In September 1997 Gerry Adams led Sinn Féin into all-party talks and in April 1998 the Good Friday Agreement was achieved. In 2005 Gerry Adams appealed to the IRA to take decisive decisions that would save the peace process from imminent collapse. As a result the IRA formally ended its armed campaign and in conjunction with the International Independent Commission on Decommissioning it dealt decisively with the issue of arms. In March 2007 Gerry Adams and the leader of the Democratic Unionist Party Ian Paisley agreed a deal which saw the political institutions restored. In 2011 he resigned from Westminster and stood in the Louth constituency in the general election for the Dáil. He topped the poll and led a renewed and strong Sinn Féin team of 14 TDs and 3 Seanadóirí into the Dáil. In 2016 23 Sinn Féin TDs and 7 Seanadóirí were returned to the Oireachtas and in the Assembly elections and Westminster elections last year Sinn Féin secured its largest ever vote in the North and won 7 Westminster seats. In February 2018 Gerry Adams stood down as party leader. Mary Lou McDonald was elected Uachtarán Shinn Féin. Gerry Adams is the author of 16 books, including: Falls Memories; A Pathway to Peace; The Politics of Irish Freedom and Selected Writings, A New Ireland – A Vision for the Future; his autobiographies "Before the Dawn" and Hope and History - Making Peace in Ireland; An Irish Voice, An Irish Journal and My little book of Tweets and his most recent book Never Give Up. Drogheda Constituency Office, Unit 6, 84 West St, Drogheda, Co. Louth. Dundalk Constituency Office, 1-2 Crowe St, Dundalk, Co. Louth. Gerry Adams is a voluntary director of Féile an Phobail Community Arts Festival.